One of the most important things we can do to help students prepare to be creative scientists is to help them understand how science works. We need to share science that looks like science—unpredictable and full of questions—rather than simple exercises in direction-following. We need students to understand the struggles and dilemmas of scientists along with their successes. We hope these stories will help students envision themselves as scientists one day. So, it seems logical that when speaking to students, especially young ones, that we might often say, “Let’s be scientists.” But a recently published study* suggests that might not always be a good idea. The researchers conducted studies with more than 500 children ages 4-6. They found that the ways they talked about science made a difference in how interested students were in continuing science activities. When they described science in terms of actions (“Let’s do science! Doing science means exploring the world!”) instead of identities (“Let’s be scientists! 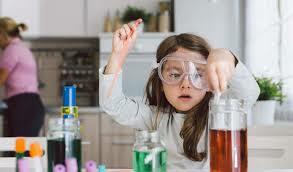 Scientists explore the world!”) girls were more likely to persist in new science games. That is, girls who felt they were “doing science” were more inclined to “do science” voluntarily than those who were trying to “be scientists.” The results were consistent across all four studies. What about the boys? In some experiments the pattern was reversed—boys were more likely to continue in science activities when they were trying to “be scientists.” In other studies boys behaved about the same way regardless of the directions. Why the difference? 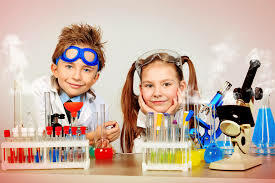 We don’t know, but it is possible that even at these early ages, both boys and girls find it easier to envision boys as “being scientists” than girls. That possibility is concerning. What do we do? Certainly, going forward, our world needs all possible creative scientists, men and women. Some of the things we can do to encourage this are straightforward. We should share stories of male and female scientists in different fields, from different cultures, and even from different times. We should structure science activities around a variety of interest areas. But perhaps we should also think about our language and the cues it may be giving. At least sometimes, let’s suggest students “Do science” and “Explore.” For the girls in your room, it may be an important invitation. « Need a Shape? We’ve Got a Template for That!